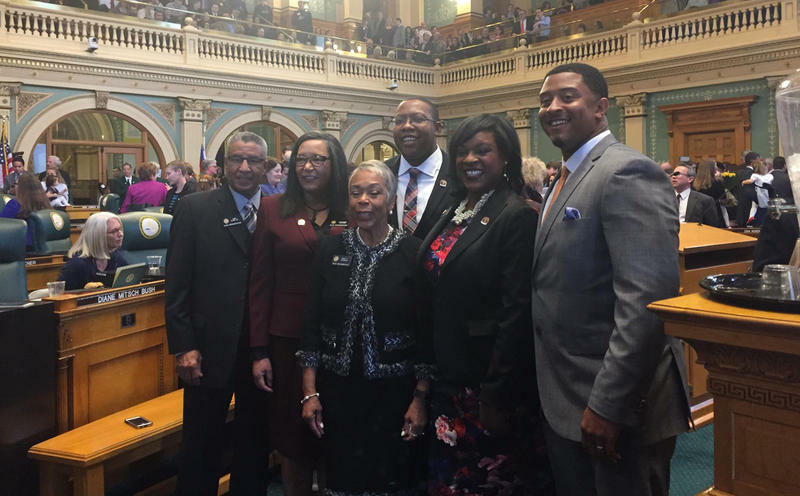 Members of the black caucus. It's the largest ever, including two black lawmakers in the Senate (not pictured). 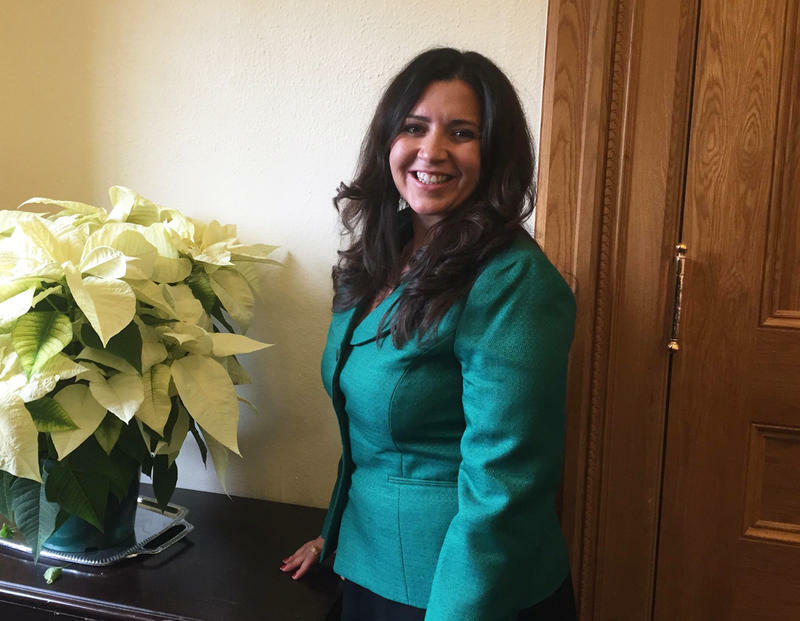 Addressing the full legislature, Speaker of the House Crisanta Duran said one top focus will be on making housing more affordable. "A bill will address high insurance rates, one of the root causes making it harder to build more new condos," she said. 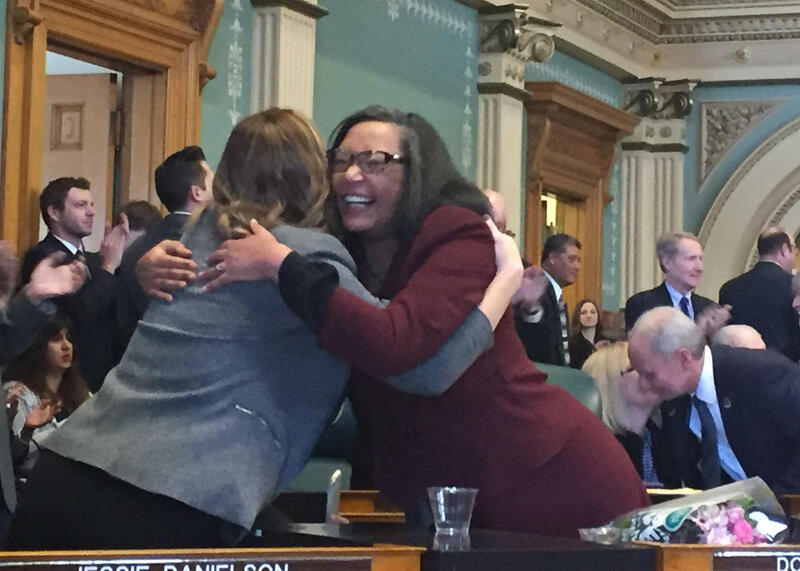 Freshman Dominque Jackson hugs a colleague after taking the oath of office. Legislative leaders in both parties, as well as Gov. John Hickenlooper, say the state should focus on fixing existing roads and bridges and build new ones to ease congestion and improve the economy. But the political parties don't agree on the best way to fund these fixes. Colorado is facing a $9-billion transportation shortfall over the next decade. 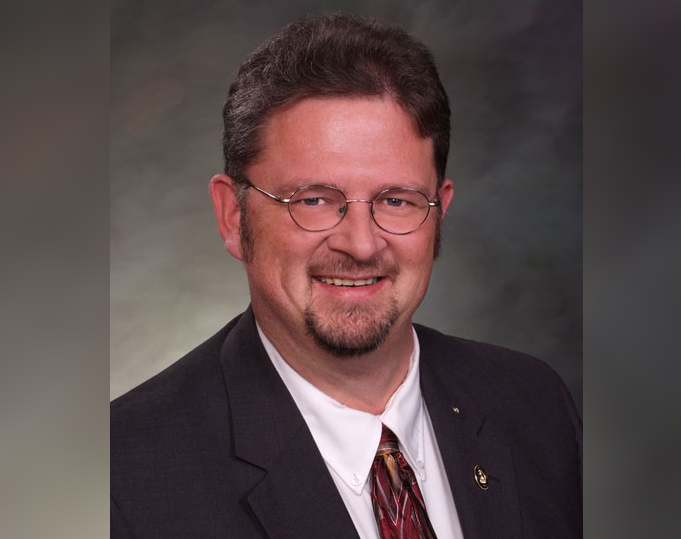 House Minority Leader Patrick Neville, R-Castle Rock, pledged to defend life, fight for gun and parental control rights, and religious liberty. He also wants lawmakers to pass fewer regulations. "We cannot attempt to solve every societal problem with another statute in the books. We have to let common sense prevail," Neville said. 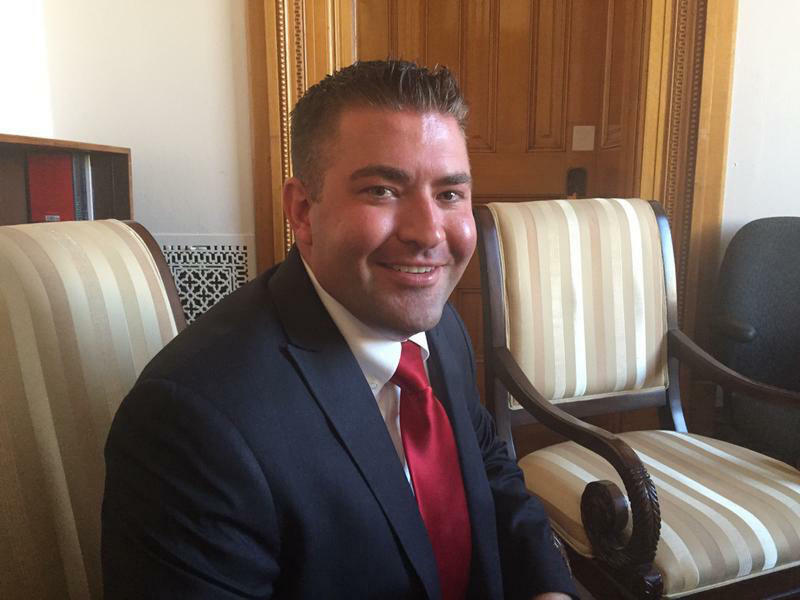 Reducing regulations was a common theme for many in the legislature, including the governor. 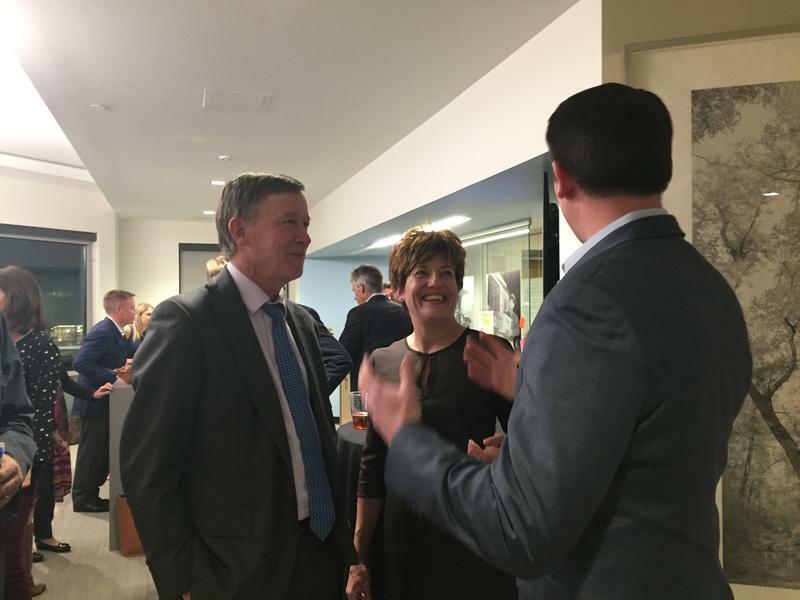 "Always looking at how we can make it less burdensome, more fair and equitable, where we really are partners with small businesses," said Hickenlooper. One area where Hickenlooper and other Democrats strongly diverge from the GOP is the future of health care and the Affordable Care Act, President Obama's signature health care law. Republican Senate President Kevin Grantham said one of the first bills the GOP will introduce seeks to repeal the state's health care exchange, echoing sentiments in Washington. "This is long overdue," said Grantham. The governor does not support a repeal without a well-defined replacement. 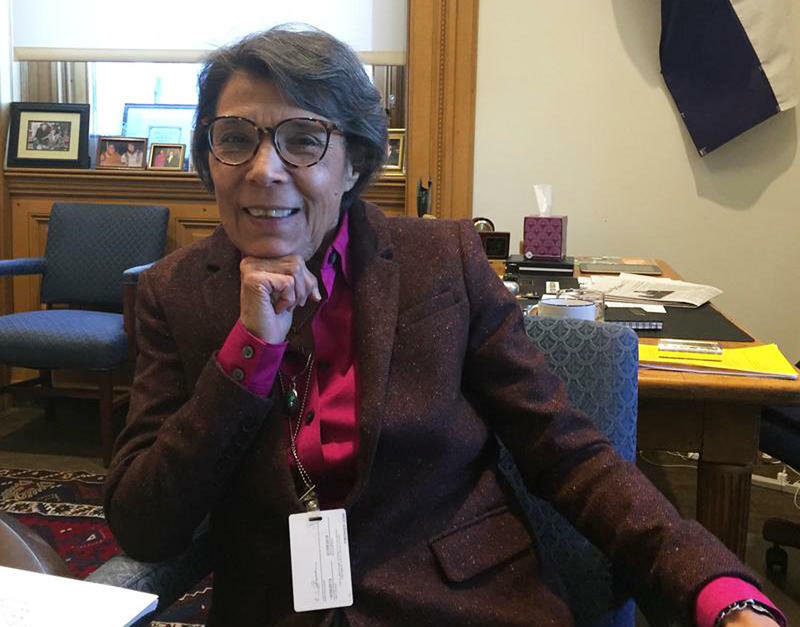 "If you don't know what is going to go in its place," said Hickenlooper, "without some real carefully thought through guardrails I think it would be irresponsible to do a wholesale repeal." 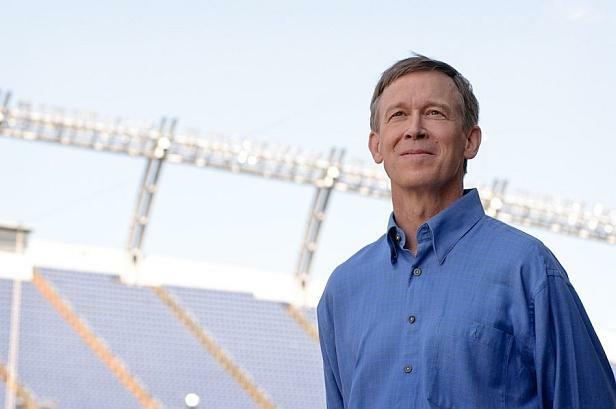 Hickenlooper's legislative agenda is outlined in his State of the State address. He said he's reluctant to get too specific in talking about particular bills, but rather wants to listen to members in both parties so they can make progress on the thorny issues that have been plaguing Colorado for years. For Cornelia Carpenter of Aspen a solution to transportation funding can't come fast enough. She works at a non-profit and shared her thoughts as we asked people around the state what they wanted lawmakers to do during 2017. "I went to school in Denver and know kids that every single weekend would drive up to the mountains and ski for the day and then they're driving back, and I've also had the privilege of sitting in traffic going up to the mountains," Carpenter said. "I think it would be huge, and I expect this of our state lawmakers, to really be honing in and figuring out the transportation issue." 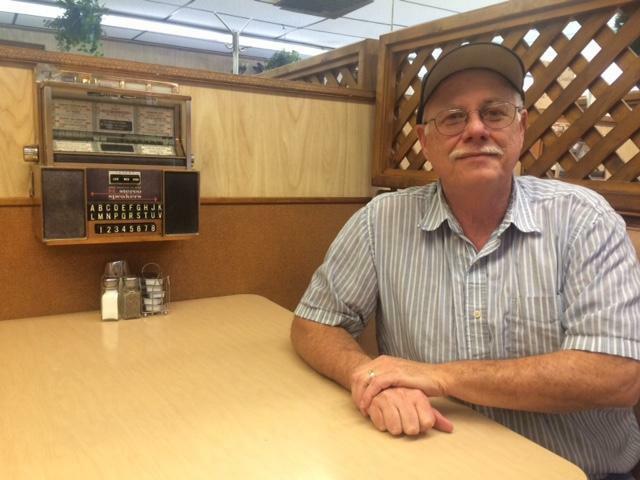 Kent Lindsay owns the El Grande Cafe in Cortez. "Buy a shredder and shred up some of those regulations they're passing down to us," said Kent Lindsay. He owns the El Grande Café in Cortez. "I'm sure somebody would be glad to give them one; I'd send them one if they'd use it," said Lindsay.